If you’ve lost your job, apply to the Jan Van Eyck Academie! The highly reputed Jan Van Eyck Academie in Maastricht, Netherlands (Map) has sent out it’s call for applications (click on “Applications” on top), to be received by the 15 April, 2009. The research program mainly reaches out to Artists, Theoreticians and Designers, but their openness always for diversity of students. If you are one of the unfortunate former employees of a Dutch office, and want to stick around the Netherlands, here is a great chance. You can bet that the competition to get in will be stiff. The Jan van Eyck Academie is an institute for research and production in the fields of fine art, design and theory. Every year, 48 international researchers realise their individual or collective projects in the artistic and critical environment that is the Jan van Eyck. In doing so, they are advised by a team of artists, designers and theoreticians who have won their spurs globally. All in all, the Jan van Eyck offers artists, designers and theoreticians time and space to do research and realise productions, either about topics of their own choosing or as part of a project formulated by the institute itself. Artists, designers and theoreticians at the Jan van Eyck Academie work alongside each other and establish cross-disciplinary exchange. The academy is not led by predetermined leitmotivs. Artists, designers and theoreticians can submit independently formulated proposals for research and/or production in the departments of Fine Art, Design and Theory. They can also participate in research projects formulated by the departments: After 1968. What is the political? ; Circle for Lacanian ideology Critique; Design Negation; ExtraStateCraft; Imaginary Property; The Cross-Cultural and the Counter-Modern. The result is a very heterogeneous programme of research topics. The miscellaneous nature of its research projects and productions make the Jan van Eyck a multi-disciplinary institute. The crosslinks which can exist between individual and/or collective projects and the exchange between researchers with different cultural and intellectual interests result in a creative and challe nging working environment. The multi-disciplinary research projects are the basis for the Jan van Eyck programme. Researchers, departments and the institute organise various weekly activities, to which special speakers are invited: lectures, seminars, workshops, screenings, exhibitions, discussions, … These activities are announced on the website and via email. The Fine Art department offers a unique space for experimentation, production, reflection and debate. Fine Art researchers conduct high-quality research in an environment that encourages the questioning of the assumptions, forms, meanings and contexts that are tied in with the practice of making art today. The fine arts department welcomes artists, individuals and groups, without stipulating conditions regarding form, content and media. The Design department focuses on design as research, discourse and publishing. It initiates and supports research projects in the areas of cultural and corporate identity, mapping, print and new media publishing, urban and regional identity, and book design. The department expressly solicits individual designers to propose and carry out their own research in exchange with the institute’s array of events and presentations. While, formerly, the department used to focus on graphic and communication design, it has since widened its scope to include spatial, product and service design. The Theory department is an international platform for reflection and research. Its mission is to create the opportunity for outstanding researchers to explore alternative ways of shaping their intellectual horizons by providing a stimulating environment for critical inquiry and intense debate. 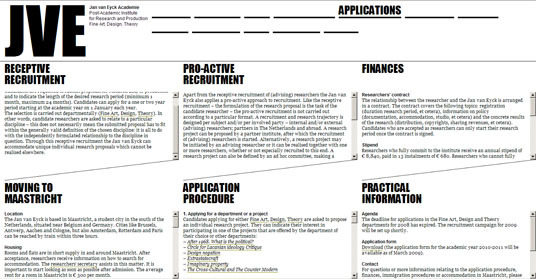 The Theory department welcomes applications from researchers of unusual promise who pursue their artistic and/or intellectual view of the interface of critical theory, philosophy, aesthetics and psychoanalysis with the visual arts. Rebuilding the Bouwkunde (TU Delft) - Coming March 14!